In an intensely prolific three-decade career filmmaker Luc Besson, once described as the French Steven Spielberg, has written and produced several dozen features, among them such blockbusters as the Transporter series and Taken with Liam Neeson. His own films as director include such highly-regarded outings as The Fifth Element, Nikita and Leon the Professional, and he is considered a pivotal figure in the Cinema du Look movement, with its emphasis on alienation, underground societies and the incessant questioning of authority. Perhaps due as much to its director’s penchant for monochrome as to monetary constraints, Besson’s 1983 feature length debut Le Dernier Combat (The Last Battle) was shot entirely in black and white. Released locally as part of Madman’s Director’s Suite, the film takes place in a post-apocalyptic futurescape, where roving gangs wander the bleak terrain in search of food, shelter and the increasingly rare prospect of female companionship. Human beings have lost the ability to speak, and the fact the entire film plays without a single word of dialogue further emphasises the isolation experienced by its characters. When we are introduced to our nameless protagonist (Pierre Jolivet), designated ‘The Man’ in the end credits, he is making love to a blow-up doll, desperate for even a semblance of human intimacy. Eventually tiring of life in his ramshackle abode, a decrepit office block in the middle of a desert populated with wordless thugs, he sets off for a distant ruined city in his rickety homemade aircraft. Existence in this bombed-out metropolis, which resembles a post-siege Stalingrad, initially appears equally tenuous and no less lonely. Beset upon by a libidinous scavenger (Gallic stalwart Jean Reno), The Man is forced to seek refuge in the sewers. Eventually however he finds solace in an abandoned hospital and befriends The Doctor, with whom he shares meals and plays table tennis in an effort to stave off the boredom of his loveless existence. That is, The Doctor reveals his secret: a woman he keeps locked up in one of the remote areas of the hospital complex. 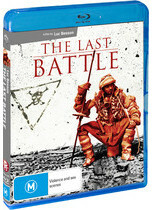 A starkly affecting melodrama interspersed with moments of Chaplin-esque levity and a distinct flair for the unexpected, The Last Battle is one of the most daring and singular entries in the canon of 1980s sci-fi. A beguiling blend of both Hollywood and arthouse aesthetics, the film succeeds. Black and white films generally present impeccably on Blu-ray, and that’s certainly the case here; it’s hard to imagine The Last Battle ever looking better than this. The film also boasts a typically intriguing score from longtime Besson collaborator Eric Serra; Josef K-esque synth noodling, fitful bursts of post-punk distemper and jags of drunken jazz, interspersed with lengthy interludes of near-silence. The whole affair both looks and sounds brilliant, and though the soundtrack is thirty years old and presented in 2.0 it wants for nothing in the way of clarity or audacity. This is the only real negative. Nothing in the way of bonus features has been included, just a theatrical trailer. Still, the film itself is essentially Mad Max done by Jean-Luc Godard, so you can’t really complain.